a name but no form. It's not something you can pick up or put down. And you certainly can't grab if. Beyond mind you'll never see a Buddha. The Buddha is a product of the mind. Why look for a Buddha beyond this mind? Bodhidharma: If you attain anything at all, it's conditional, it's karmic. It results in retribution. It turns the Wheel. And as long as you're subject to birth and death, you'll never attain enlightenment. To attain enlightenment you have to see your nature. Unless you see your nature, all this talk about cause and effect is nonsense. Buddhas don't practice nonsense. A Buddha free of karma free of cause and effect. To say he attains anything at all is to slander a Buddha. What could he possibly attain? Even focusing on a mind, a power, an understanding, or a view is impossible for a Buddha. A Buddha isn't one sided. The nature of his mind is basically empty, neither pure nor impure. He's free of practice and realization. He's free of cause and effect. Bodhidharma: The mind is always present. You just don't see it. Bodhidharma: When you dream, is that you? 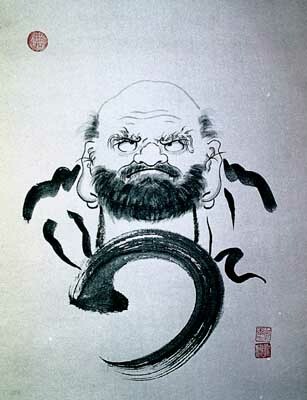 Bodhidharma: And is what you're doing and saying different from you? Even if a Buddha or bodhisattva" should suddenly appear before you, there's no need for reverence. This mind of ours is empty and contains no such form. Those who hold onto appearances are devils. They fall from the Path. Why worship illusions born of the mind? Those who worship don't know, and those who know don't worship. By worshipping you come under the spell of devils. I point this out because 1 afraid you're unaware of it. The basic nature of a Buddha has no such form. Keep this in mind, even if something unusual should appear. Don't embrace it, and don't fear it, and don't doubt that your Mind is basically pure. Where could there be room for any such form? Also, at the appearance of spirits, demons, or divine conceive neither respect nor fear. Your mind is basically empty. All appearances are illusions. Don't hold on to appearances. If you envision a Buddha, a Dharma, or a bodhisattva" and conceive respect for them, you relegate yourself to the realm of mortals. If you seek direct understanding, don't hold on to any appearance whatsoever, and you'll succeed. I have no other advice. The sutras say, "All appearances are illusions." They have no fixed existence, o constant form. They're impermanent. Don't cling to appearances and you'll be of one mind with the Buddha. The sutras say, "'That which is free of all form is the Buddha."